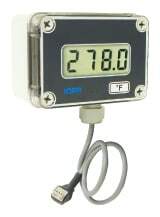 LCD-W12 is a digital, high-precision LCD indicator for local measurement of process values and sensor failure monitoring. It connects directly to the communication port of our PROFIBUS transmitters, ProfIPAQ-H and ProfIPAQ-L. It can be connected and disconnected at any time. LCD-W12 communicates digitally with the transmitters and offers Unlimited accuracy as well as temperature and long-term stability. There is no need for scale adjustments or calibration of the indicator. LCD-W12 is designed for field mounting on wall, pipe or DIN rail and has a rugged and splash proofhousing.